Annual and fourth quarter revenues of $39.8 million and $20.6 million, respectively, led by California retail stores posting $6,257 average sales per square foot and 84% conversion rate for the fourth quarter. Enters Fiscal 2019 with leading US market position with 12 states, 67 retail stores and 14 factories with pending PharmaCann acquisition. Added eight store locations throughout California, New York and Nevada during the year. Entered Florida market and signed agreements to enter Arizona and Illinois markets subsequent to quarter end, with combined addressable adult population of over 40 million (assuming full adult-use). Launched [statemade], the Company’s first cannabis product line, which is focused on categories that represent 90% of products sold in MedMen stores. Raised over $250 million in gross proceeds through capital markets and financing activities since RTO in May. LOS ANGELES, October 25, 2018–(BUSINESS WIRE)–MedMen Enterprises Inc. (“MedMen” or the “Company”) (CSE: MMEN) (OTCQX: MMNFF) (FSE: A2JM6N), today released its consolidated financial results for the fourth quarter and fiscal year 2018 ended June 30, 2018. All financial information in this press release is reported in US dollars, unless otherwise indicated. Since becoming a public company in May of this year, we’ve been singularly focused on our vision to mainstream marijuana and I’m proud to say that our hard work and the significant investments we’ve made in building our operating platform and team are paying off. For fiscal 2018, we delivered solid revenues of almost $40 million and over half of that was in the fourth quarter alone, indicative of the strong momentum in our business and our growth potential. 2018 is a year of many milestones, including the pending PharmaCann acquisition; closed and pending expansions to Northern California, Illinois, Arizona and Florida; successes in accessing the capital markets; and the launch of our suite of [statemade] products and brand strategy. With our strengthened Board of Directors and management team, diverse asset base and strong balance sheet, we believe we are well positioned to capture the future potential of the evolving cannabis industry. Fourth quarter 2018 systemwide revenue was $20.6 million, up 1,317% from $1.5 million in fourth quarter 2017 and 44% from $14.3 million in third quarter 2018. The increase was primarily due to the majority of MedMen’s stores coming on line during the quarter. Fiscal year 2018 systemwide revenue was $39.8 million, up 1,390% from $2.7 million in fiscal year 2017. Reported average sales per square foot of $6,257 including Abbot Kinney and customer conversion rate of 84% for all California stores for the fourth quarter. Reported over 700,000 sales transactions from all MedMen stores for fiscal year 2018. Acquired the assets of Nevada Wellness Project, LLC, including a dispensary license on June 29. Opened its store on Venice’s Abbot Kinney Boulevard on June 9. Opened Project Mustang, a state-of-the-art cultivation and production facility in Reno, Nevada. Acquired all of the assets of San Diego Health and Wellness Center, Inc., dba Apothekare, including a dispensary license on February 16. Acquired two Nevada dispensary licenses from LVMC, LLC and Just Quality, LLC in January 19 and February 9, respectively. Subordinate voting shares began to trade on the OTCQB Venture Market under ticker symbol “MMNFF” on June 18. Subordinate voting shares listed on the Canadian Securities Exchange (“CSE”) under the ticker symbol “MMEN” and began trading on May 29. Completed reverse takeover of a Canadian public company. In connection with this reverse takeover and the listing on the CSE, the Company raised gross proceeds of approximately C$143 million, or US$110 million, through a private placement at an implied enterprise valuation of C$2.14 billion, or US$1.65 billion on May 29. Up-listed the subordinate voting shares from the OCTQB Venture Market to the OCTQX Best Market on October 24. Announced binding letter of intent to acquire PharmaCann on October 11 in an all-stock transaction valued at $682 million (based on the closing price of the subordinate voting shares on October 9). The transaction will double the number of states where MedMen has licenses to 12, which accounts for over 50 percent of the total estimated 2030 U.S. addressable market of $75 billion as stated by the Cowen Group. Combined, MedMen and PharmaCann would be licensed for 67 retail stores and 14 factories, including pending acquisitions by MedMen. Closing is expected to occur in 6 to 12 months, following receipt of regulatory approvals. Expanded footprint into Northern California with the pending acquisition of two licensed dispensaries in San Jose and Emeryville. Entered Illinois market through the pending acquisition of a licensed medical dispensary in Oak Park. Entered Arizona market through the pending acquisition of a medical marijuana wholesaler with licensed dispensary, cultivation and processing operations, as well as an exclusive co-manufacturing and licensing agreement. Closed major strategic acquisition of dispensary and cultivation in Florida, including a license that permits up to 30 medical marijuana dispensaries, as well as cultivation, delivery and manufacturing operations in Florida. Received approval from the State of New York to manufacture and sell cannabis-infused lotions and topical pain-alleviating sprays for medical marijuana patients on July 31. MedMen is one of only 10 companies licensed to manufacture and sell medical marijuana in New York. Opened first MedMen branded store in downtown Las Vegas on July 19. The store opening marked the Company’s 14thstore nationwide. Completed two strategic minority investments in Old Pal, a popular California-based brand that provides every day, high-quality cannabis flower, and in The Hacienda Company, a California-based brand known for its packs of pre-rolls named Lowell Smokes. Launched the Company’s first comprehensive suite of new cannabis products under the brand [statemade] during the opening of the second branded store in Las Vegas, MedMen Paradise, on October 5. The [statemade] product line includes tincture drops, vaporizer pens, flower and pre-rolls. Gained exclusive right to use the Woodstock name for cannabis products manufactured and sold in six states: California, Nevada, Massachusetts, Florida, Illinois and Arizona. Also obtained premium placement of cannabis products at Woodstock music festivals and promotions. In early October, MedMen closed a $77 million senior secured term loan (the “Facility”) with funds managed by Hankey Capital and an affiliate of Stable Road Capital. The principal amount under the Facility will accrue interest at a rate of 7.5 percent per annum, paid monthly, with a maturity date of 24 months following the date of closing. The proceeds from the Facility will be used for acquisitions, capital expenditures and other corporate expenses. 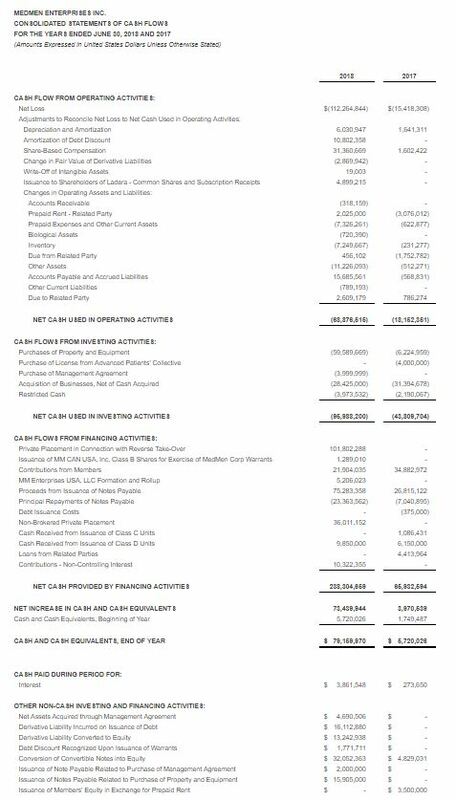 For additional information on the terms of the Facility and the warrants issued in connection with the Facility, please refer to the footnotes in the annual financial statements of the Company. On September 27, the Company completed a bought deal financing (the “Offering”) of 15,681,818 units at a price of C$5.50 per unit, which included the exercise in full by the underwriters of their over-allotment option, for aggregate gross proceeds of approximately C$86,250,000. Each unit consisted of one subordinate voting share and one-half of one share purchase warrant, with each whole warrant entitling the holder to purchase one subordinate voting share for C$6.37. Subsequent to fourth quarter 2018, MedMen expanded its executive team and continued to build its Board of Directors with the appointment of four seasoned outside directors. Ben Cook as chief operating officer. Cook is a global supply chain veteran with 15 years of experience running logistics for retail giants Sam’s Club, Target and Apple. David Dancer as chief marketing officer. Dancer is a veteran marketing executive with more than 25 years of experience leading brands such as Teleflora, Charles Schwab, Visa and American Express. Clarence Foster as senior vice president of human resources. Foster is an accomplished human resource professional with over 20 years’ experience leading companies in the manufacturing, automotive and consumer products industries, including Nissan Motors and L’OREAL. Benjamin Rose (Chairman of the Board of Directors), chief investment officer of Wicklow Capital. Antonio Villaraigosa, former Mayor of Los Angeles and past president of U.S. Conference of Mayors. Stacey Hallerman, former vice president, chief legal counsel and corporate secretary at Richemont North America. Jay Brown, co-founder and chief executive officer of RocNation. Beginning in the fourth quarter of 2018 and consistent with IFRS consolidation standards, the Company has included results from managed store locations in its consolidated financial results. Fourth quarter 2018 and fiscal year 2018 financial results presented herein have been adjusted to reflect this change. Additionally, the Company will refer to consolidated Company revenue as “systemwide revenue” hereafter. Further discussion can be found in the Company’s MD&A filed on SEDAR. For the fourth quarter 2018, systemwide revenue was $20.6 million across the Company’s operations in California, Nevada and New York. This represents a 44% increase over the third quarter, driven primarily by the opening of additional retail stores and strong results from the California market. 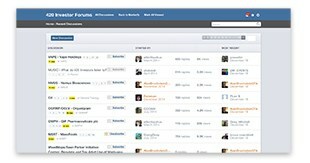 The Company operated 13 locations at the end of the fourth quarter as compared to 11 at the end of the third quarter. Southern California accounted for 92% of fourth quarter systemwide revenue and 8 out of the 13 open retail stores at quarter end. Gross profit for the fourth quarter, before biological asset adjustment, was $5.9 million, being a gross profit margin of 29%, as compared to $6.1 million, or a gross profit margin of 43%, in the third quarter. The decline in gross profit margin was primarily due to a one-time liquidation of inventory in the Company’s California stores. As of June 30, the Company was legally required to stop selling certain products in connection with the state’s transition from a medical-only market to a recreational market, resulting in the liquidation. During the fourth quarter, the Company made significant investments in building the corporate infrastructure and team required to execute its strategy for long-term growth. Operating expenses for the fourth quarter, including SG&A, was $72.6 million. SG&A expenses included $4.7 million in marketing and branding, $13.6 million for salaries and benefits, of which $3.9 million was retail related. 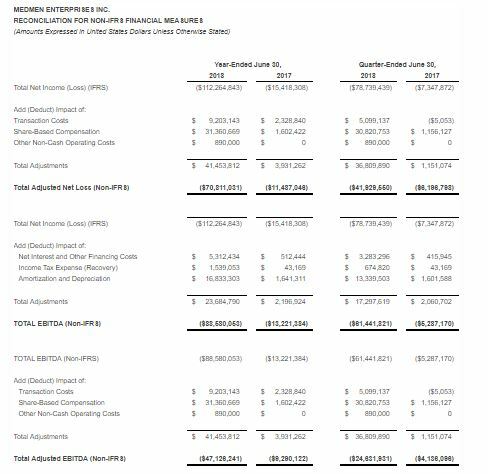 SG&A expenses for the fourth quarter also included a one-time expense related to the Company’s RTO of $2.7 million, acquisition related costs of $3.5 million and a $30.8 million non-cash stock-based compensation and employee incentive plans expense. Other expenses for the quarter was $12.1 million, of which $10.8 million relates to non-cash amortization of discounts on convertible debt and warrants offered under financing arrangements. Total adjusted EBITDA loss, excluding one-time charges related to the RTO, acquisition related costs and non-cash share-based compensation expense, was $24.6 million for the fourth quarter. For fiscal year 2018, the Company reported system-wide revenue of $39.8 million as compared to $2.7 million in fiscal year 2017, representing a 1,390% increase. Gross profit for the full year, before biological asset adjustment, was $13.1 million, as compared to gross profit of $868,000 in fiscal 2017. Increases in revenue and gross profit were primarily driven by the addition of eight new operating retail locations in fiscal year 2018 and the introduction of adult-use in the state of California, which is MedMen’s largest market. Gross profit for fiscal year 2018, was impacted by the aforementioned liquidation of inventory in the fourth quarter. Operating expenses for fiscal year 2018, including SG&A, was $110.5 million. SG&A included $7.0 million in sales and marketing expenses, and $98.2 million in general and administrative expenses, of which $26.5 million was payroll expenses attributable to the Company’s 21 departments. $8.7 million of payroll expenses were attributable to retail. SG&A for the year included $2.7 million in one-time expense related to the RTO, $31.4 million in non-cash stock-based compensation expense and $7.7 million for acquisition-related costs. Other expenses for fiscal year 2018, were $14.1 million, which consisted of interest expense of $5.3 million and $10.8 million of non-cash amortization of discounts on convertible debt and warrants offered under financing arrangements. For the fiscal year 2018, the Company reported a net loss of $66.6 million, or $2.77 per basic and diluted share. 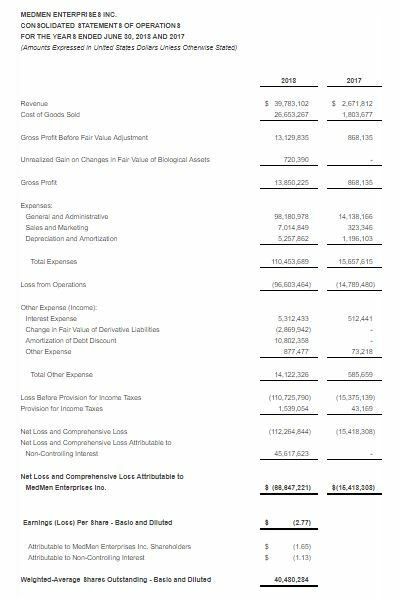 Total adjusted EBITDA loss, excluding one-time charges related to the RTO, non-cash share-based compensation expense and acquisitions related costs, was $47.1 million for the 2018 fiscal year. A full reconciliation of Adjusted EBITDA is available at the end of this press release. 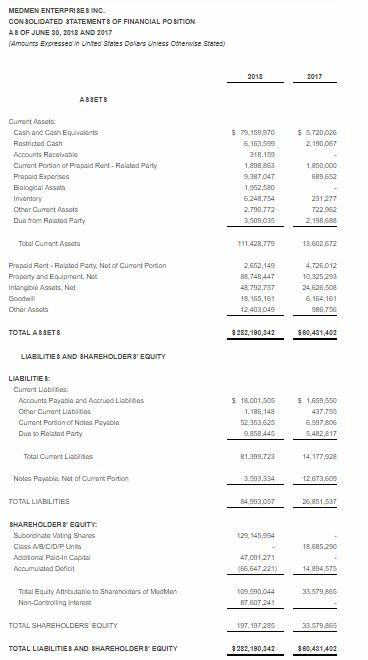 As of June 30, 2018, total assets were $282.2 million, including cash and cash equivalents of $79.2 million. Total debt was $56 million. In the fourth quarter 2018, the Company invested $40.7 million of cash into operations, $24.1 million into capital expenditures, and $8.4 million into acquisitions. The number of subordinate voting shares outstanding on a fully diluted basis is approximately 441 million as of October 17th. This total is comprised of approximately 360 million redeemable shares of MM CAN USA, Inc., approximately 10 million redeemable units of MM Enterprises USA, LLC, and approximately 71 million subordinate voting shares in the public float. Additional information relating to the Company’s fourth quarter and full year 2018 results is available on SEDAR at www.sedar.com in the Company’s Annual Financial Statements and Management Discussion & Analysis (“MD&A”). In this press release MedMen refers to certain non-IFRS financial measures such as Adjusted EBITDA, being Earnings Before Interest, Taxes, Depreciation and Amortization (EBITDA) less certain non-cash equity compensation expense, including one-time transaction fees and all other non-cash items. These measures do not have any standardized meaning prescribed by IFRS and may not be comparable to similar measures presented by other issuers. Please see the “Supplemental Information (Unaudited) Regarding Non-IFRS Financial Measures” at the end of this press release for more detailed information regarding non-IFRS financial measures and a reconciliation of Adjusted EBITDA to Net Income (Loss). 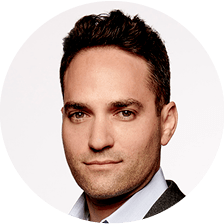 MedMen Enterprises will host a conference call and audio webcast with Chief Executive Officer and Co-Founder Adam Bierman and Chief Financial Officer James Parker today at 8:00 a.m. Eastern to discuss the financial results in further detail.